In the warmth of our national waters, where seagrass and freshwater vegetation flourish, migratory manatees find their way through coastal and inland waterways. One of them is named Kobee, and he’s about to go on one of the most thrilling adventures of his life. Manatees are considered an endangered species and are protected by the federal government—but for Kobee Manatee of Kobee Manatee: A Wild Weather Adventure, the biggest concern of the day is how he will survive the mighty Atlantic, powerful Gulf Stream, and a hurricane to surprise his sister Kim on her birthday. 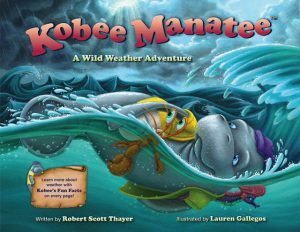 This is the second installment of Robert Scott Thayer’s Kobee Manatee picture book series, which has won several awards since its debut in 2013. A Wild Weather Adventure recently won the Silver Medal in the 2015 Readers Favorite International Book Awards in Miami. Each page of Kobee Manatee: A Wild Weather Adventure includes in-depth, scientific details titled “Kobee’s Fun Facts,” which expand on weather events the characters encounter along the way. This educational tool has been resourceful for classrooms to further the discussion about science, weather, and endangered manatees. Kobee Manatee: A Wild Weather Adventure includes rich, colorful and dynamic illustrations, with something new to discover upon each reading. The playful and suspenseful prose lends itself well to numerous read-alongs by parents, librarians, educators, and storytellers. Children have the opportunity to learn without feeling like they’re in a classroom. Robert Scott Thayer is principal partner of Thompson Mill Press. In addition to writing children’s books, he is a recording artist who writes and sings in the children’s genre. “Kobee’s Song,” his latest children’s tune, was produced by Grammy award winner Jim Cravero. Thayer is a member of the Author’s Guild, Society of Children’s Book Writers and Illustrators, the Save the Manatee Club, and BMI. He lives in Bucks County, Pennsylvania. One day, nine-year-old Charlotte has two surprises—she notices a patch of the forest slowly vanishing and discovers a lost puppy caught in a bramble bush. She rescues it and takes it home. Returning to the woods, she notes the sinking area getting wider and deeper. Her parents and the authorities caution her to stay away, but Charlotte worries the sinking will allow other puppies to escape the kennel and get lost, too. When another puppy escapes and becomes trapped in the now enormous sinkhole, Charlotte can find no one else to help it. As a fierce rainstorm arises, and the fallen tree the pups cling to begins to disappear through the opening at the center of the sinkhole, she realizes it is up to her to save the pups. 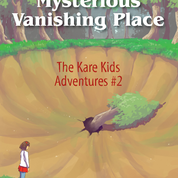 Can she rescue the pups and get out herself before the giant sinkhole swallows everything? This is a delightful book for children! Do you have a child who loves Legos? This one is a must-read! While some LEGO models require thousands of pieces, anyone can make an impressive replica with fewer than 10 bricks, a dash of creativity, and the latest book from No Starch Press. Hailed as the “new LEGO bible” by VICE, Tiny LEGO Wonders(No Starch Press, $24.95, 208 pp., July 2016) is a collection of step-by-step building instructions for 40 compact yet realistic miniscale models—each built with fewer than a few hundred bricks. Packed with stunning models of engineering feats like a muscle car, a fire engine, a Swiss locomotive, and wooden ships, Tiny LEGO Wonders teaches readers how to make the most of their LEGO collection, no matter its size. Tiny LEGO Wonders will be available online and in fine bookstores everywhere since this past July. I received a copy and am really impressed with this one! I highly recommend! Are you Crafty? 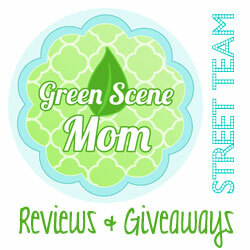 Do you have a Tween or Teen that is? This is a great book to read! 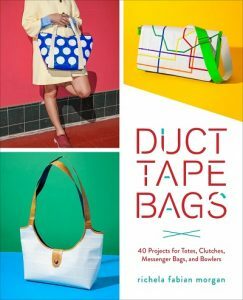 From the author of the #1 best-sellers, Tape It & Make It, Tape It & Make More and Tape It & Wear It comes the fourth book in this revolutionary “duct tape craft series:” Duct Tape Bags: 40 Projects for Totes, Clutches, Messenger Bags, and Bowlers(Clarkson Potter, July 2016). With the upcoming release of her new book, Richela Fabian Morgan is continuing to take the crafting and fashion world by storm, turning the humble roll of duct tape into the trendiest craft item since glitter glue. Everyone from trendy teens to famous fashionistas can begin exploring the infinite uses this easy-to-follow guide provides to making handbags so fashionable, you won’t actually believe they’re made of duct-tape. Part art-piece, part usable accessory, Fabian Morgan shows how each of these gorgeous handbags can be recreated one manageable section at a time. This is a really imaginative and creative book! I was amazed with the Bags I saw in this book! 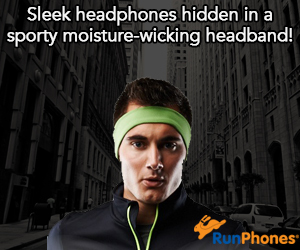 I also love how detailed the instructions are! I’m not quite crafty enough to make some of the bags but I know a crafty teenager girl who is having a blast with this book! And tons of other one-of-a-kind bags! Are you a Harry Potter fan? You will love this one! Fans will be as busy as Mrs. Weasley knitting her Christmas sweaters as they dive into dozens of Potterific projects. Drop some homemade Pygmy Puff Bath Fizzies into the tub, keep memories of the Quidditch pitch close with a Golden Snitch Necklace, or show off the Sorting Hat’s selection with a House Colors Tie-Dye Shirt. 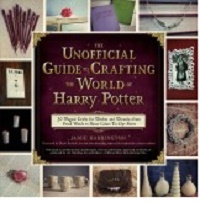 This really is a must for all Harry Potter fans! Jamie Harrington is the creator of TotallyTheBomb.com, where she blogs about crafts, recipes, and parenting. Her work has been featured by Buzzfeed, the Huffington Post, and all over the blogosphere. Jamie is a regular contributor to the Huffington Post and the managing editor of their Kids Activities blog. This next one is great for younger kids! 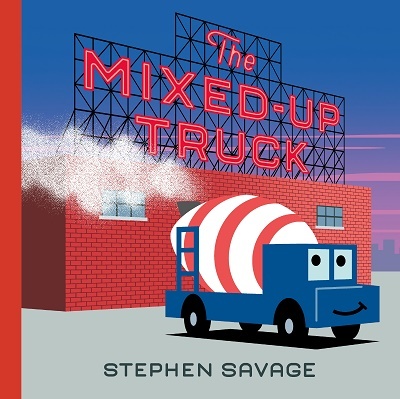 THE MIXED-UP TRUCK, written and illustrated by New York Times bestselling author Stephen Savage. This picture book follows the naive and charming Cement Mixer truck during his first day of work, where he falls into an unfortunate cycle of mixing the wrong ingredients—yielding cakes, bubble baths, and anything but a building! The sweet story, which has already received glowing reviews from Publishers Weekly, Kirkus Reviews, and School Library Journal, highlights the importance of perseverance to young audiences. It’s a great bedtime read, and the colorful illustrations really bring the characters in the construction zone to life. It is a delightful story with fun illustrations! I highly recommend for ages 3-6. I really like this next one because it really is okay to be different! The Spinfords – Delightful Children’s Book Teaches Kids to Celebrate Their Differences. What is the one thing kids are often more scared of than anything else? Being different! In a world that encourages us to look alike, dress alike, and think alike, it can be daunting and confusing to a child (and parents!) to identify with anything but the “norm.” The truth is, though, is that the world is changed the most by people who dare to be different. 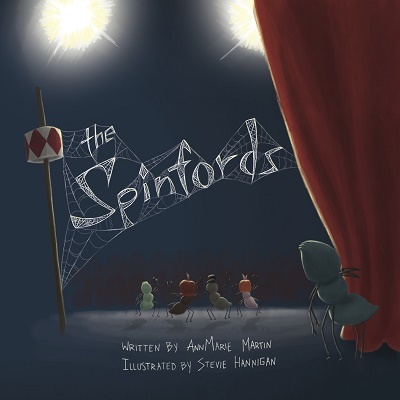 In the fun and relatable new children’s book The Spinfords (June 2016) by AnnMarie Martin, beautifully illustrated by Stevie Hannigan, families will meet The Spinford family, a group of circus spiders who spin beautiful webs for big crowds each night. But upon welcoming their new son Salvatore into the family and almost the family business, they aren’t too happy with his unorthodox ideas of what constitutes a “web.” With the help of his grandfather and cousin, Salvatore is given the confidence to push forward with a secret performance of his own special making that wins the crowd over, proving that people and bugs alike can see the beauty in something new. I think all young children should read this one! You can find it on Amazon.com and you can find out more here. New teen fiction helps kids dealing with sick parents! The Relic, the newest teen novel from award-winning author Clark Burbidge. Teenagers Tim and Martie Carson are the only ones that can save their family from a downward spiral fueled by their parent’s struggles with PTSD and depression. An ancient relic discovered under mysterious circumstances holds the key to unlocking answers that can only be found in the past. In a race against time they must learn its secrets while avoiding the dangerous shadowy figures, doomed to haunt history, that are drawn to possess the relic for their own wicked purposes. 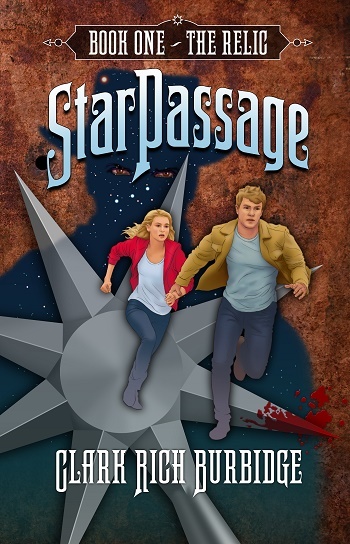 From the award winning story teller, Clark R. Burbidge, comes the first book in a new young adult fantasy adventure series, StarPassage: The Relic, a non-stop spell-binder with surprises and suspense at every turn. Travel through history with the Carson family as they struggle to understand the relic’s purpose. Can they follow the clues and piece together the puzzle containing the answers they seek before being trapped forever by the evil forces that relentlessly pursue them? I found this to be a fun and interesting book to read and recommend it for ages 13+. More info on Clark at prbythebook.com/clark-burbidge. This next one is really cool! Two teenagers actually illustrated this one too! 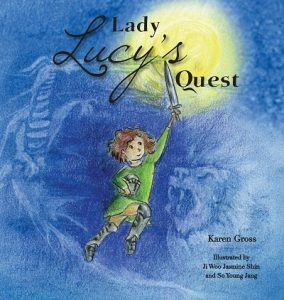 Lady Lucy’s Quest by Karen Gross. I love that this book encourages kids to follow their dream! This is a story of a feisty young girl who wants to be a Knight in the Middle Ages and believes in the power of the possible. Quest after quest, Lady Lucy must prove her worthiness to join the Knights of the Round Table. But will her unusual and unique solutions to each hurdle and obstacle thrown in her path lead her to success? This delightful book demonstrates the importance of pursuing one’s dreams and is sure to inspire kids that they CAN achieve what might seem to be impossible! Karen Gross is the author of the book, and this message was important for her to pass on to her young son. Karen is actually a lifelong teacher/professor, and former Senior Policy Advisor at the U.S. Department of Education. She is passionate about student learning and empowerment, and hopes this new book will inspire kids across the country that they can achieve what seems to be impossible. She herself is living proof of that! 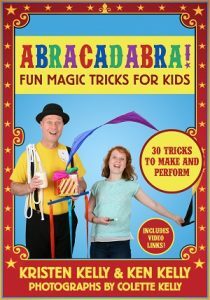 Does your child love Magic Tricks? This next one is a real must-buy! I absolutely love this one! I like that it is not real complicated like many other magic trick books! Kids will find this one fun and easy to follow! Adults aren’t needed to help with most of the magic tricks and you will be amazed when your kids do magic! I highly recommend! You can purchase at Amazon, B&N, IndieBound. Self Disclosure: I received free copies of the above books to feature.